Moon attended a rare special mass for Korean peace at the Basilica of St Peter, presided over by Cardinal State Secretary Pietro Parolin. 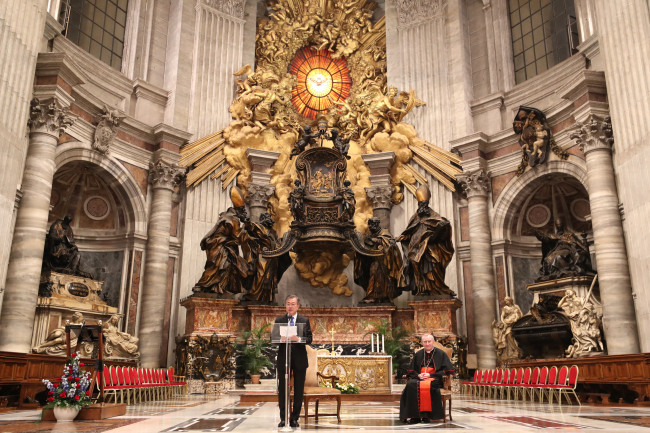 President Moon Jae-in summoned the Christian love for humanity and the European spirit of unity to inspire peace on the divided Korean Peninsula Wednesday, as the South Korean leader preached his policy to engage and denuclearize the rival North at the Vatican. “The United States too has sat down face to face with North Korea to end their 70 years of hostility. As the pope prayed before the North Korea-US summit, we are ‘developing a positive path that assures a future of peace for the Korean Peninsula and the whole world,'” he added. “We must further encourage North Korea’s denuclearization process by easing UN sanctions when and if we decide the North’s denuclearization process has at least reached a point of no return,” he was quoted as saying during the summit.